Salt is in the air and the sun is shinning bright, so lets head to the beach! We geared up with all our new Kids Lucky We Live Hawaii clothing line. We now have our standard trucker logo hat in youth sizes for those long summer days in the sun. 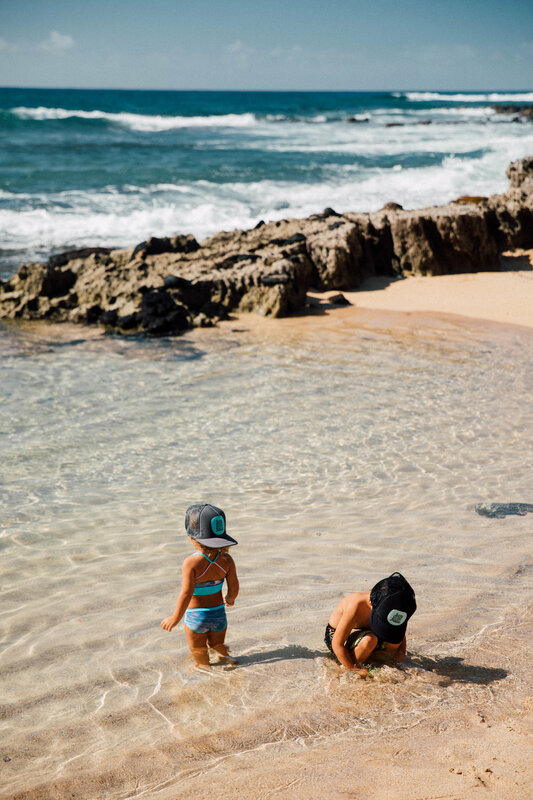 Theres no better place to be when your a kid, Lucky We Live Hawaii! Shop our Kids Collection HERE. Summer is here and the best part is longer days and beautiful sunsets! We headed down to the beach for an afternoon hang. Summer styles featuring our Wahine's Do It Better pocket tee and Lucky We Live Hawaii Rainbow Trucker. We brought in a new hat style just in time for summer! This new look features a polo cap style that has 6 panels with an unstructured fit and vintage wash look. The LWLH rainbow logo design is embroidered in the front of the hat. In the back there is an adjustable sliding buckle for your own personal fit. Its the perfect hat if your wanting something a little more stylish than your everyday trucker hat. Comes in three different colors, so have fun choosing your favorite, we love them all! If you like what you see, shop your favorite color below! Just click any of the 3 options to shop now! One of our favorite adventures and photographers, Dylan Lazo, wearing our Mens' distressed logo tee. This breathtaking view of the Napali Coast is one of our favorite sites to see! Check out Dylan for his awesome underwater and hiking photos! He sure makes us see the reasons why we are so lucky to live in Hawaii! Introducing our Kauai Map Towel! We are so excited to introduce our first beach towel featuring our Kauai Island Map design in teal green! Super soft and comfy fabric perfect for all your adventures. Now on our online shop! We are excited to release our first men's t-shirt! Here is Austin in our new distressed logo tee in the Navy and Gold color. This tee features a front pocket hit with a back logo design. To shop this look, check out our online shop now! Sneak peak of what is to come for Lucky We Live Hawaii. We have our first men's logo wear coming to the shop soon, so stay tuned! The Pillbox Hiking Trail (also known as the Ka'iwa Ridge Trail) is a local favorite to catch some amazing panoramic views of Oahu's eastern coastline. Taking only about 20 minutes to reach the highest point, this trail overlooks some of Kailua's best attractions including Lanikai Beach, the Mokulua Islands and Waimanalo to name a few. The two "pillboxes" along the trail were once used as bunkers for the military as look out points. Now days we just use them to get a better look of the beautiful scenery! Standing up on the boxes you cant help but take it all in and say, "Lucky We Live Hawaii!"